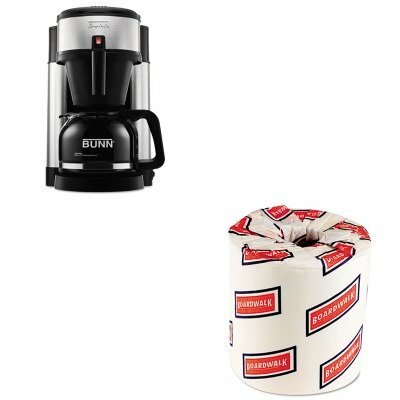 KITBUNNHSBWK6180 - Value Kit - Bunn Coffee 10-Cup Professional Home Coffee Brewer (BUNNHS) and White 2-Ply Toilet Tissue, 4.5quot; x 3quot; Sheet Size (BWK6180) by Unknown at Bid Proposal Form. MPN: BUNNHSBWK6180. Hurry! Limited time offer. Offer valid only while supplies last. lt;stronggt;BUNNHSlt;/stronggt;lt;BR/gt;Bunn Coffee 10-Cup Professional Home Coffee Brewerlt;BR/gt;Brewing system brews coffee in three minutes. lt;stronggt;BUNNHSlt;/stronggt;lt;BR/gt;Bunn Coffee 10-Cup Professional Home Coffee Brewerlt;BR/gt;Brewing system brews coffee in three minutes. Features stainless steel inner tank, internal thermostat and vacation switch to turn tank heater off when brewer will not be used for a long period of time. Number of Cups: 10.lt;BR/gt;lt;BR/gt;lt;stronggt;BWK6180lt;/stronggt;lt;BR/gt;Bunn Coffee 10-Cup Professional Home Coffee Brewerlt;BR/gt;The economical choice for quality bathroom tissue. Embossed, standard size roll. Tissue Type: Toilet Number of Plies: 2 Number of Sheets: 500 per roll.